- sorry Vickie as it must be some dreadful hour over your way.. it is 5pm here so been up for hours and thinking about tea and bed when you are just stirring... and cannot believe how organised you are Julia! well done girl! And here I thought I was being extra good starting my Christmas letter today!! but guess you have the head start on all of us yet!! Oh you can go off people Julia! I was wanting to ask everyone if they wouldn't mind delaying Christmas by a few weeks...somehow I don't think that's going to happen! Guess I better get on then...humbug! Happy WOYWW Julia, oh and congrats on the cards. Must get started ... ho hum. RosA # 9 (which is as good as #1 as far as I'm concerned). Morning Julia, WOW you changed the time so I got oh so close to #1. OK So I was up in the middle of the night too and wondering whether you were OK as there wasn't a post but I didn't fret and went back to sleep OK.
Can't believe you have "written" all you cards as I was surveying my box last night and saw that I was still about 30 down in the number stakes, I really must try harder. Saying that I have been doing a daily journal challenge for November and have had a cough/cold the past 5 weeks or so. Maybe today is the day to crack on with the cards. Your desk looks very inviting today, probably the little tape thingy I'd like to get my paws on, or the button jar or even come and clean all your stamps. I never get too much done in the stamping department as I just have to clean as I go!!! Sure there is a name for that! So glad you are here. I got up at 5 to post and you were nowhere to be found! Love the desk and am quite jealous about the christmas card writing, my goodness you are fast! Now if they are in the post by next week, I will be in awe! Oh my, there are now 2 kyla's! That threw me! Ohh what a tidy desk and smug is warranted if you've got your cards made and written. I dream of such things and then actually think I have done it!! Enjoy your week. You've written yours already! And I was pleased to have made 3 cards! Back to AM posting! Once again I am in awe of your post. Finished your cards? Wow. Funny, but I seem to have reverted to a craft knife and scissors as I am sick of my wonky trimmer and not keen to buy yet another one, or endless blade pods when a snap off blades knives cost pennies. Anyway, a full day, as ever, but looking forward to the hopping this week. Christmas cards written AND an organized scrap box? You have every right to feel smug. I'll be back to link up later -- I didn't take a picture on Tuesday afternoon so I think I'll wait for the light of day to do it. My desk is clean, though. Clean, clean, and utterly clear. It makes me slightly smug but mostly eager to get stuff out onto it again! Now I'm really ashamed of my space, yours is looking wonderfully neat and tidy. oh wow, finished the Christmas cards! you have every right to be smug!!! And you deserve to be a tad smug. Wish I was in the same position, but I'm not as you'll see if you have a moment. Your desk looks good, nice cuppa for the drinking. I know there's a bit of light-hearted competition for #1 spot but for me the convenience of getting it done and getting a number for my comments. Visited a few today with no number, otherwise I don't get it done. I've periodically refreshed my Julia page all day and began to think that Blogger was mucking up. What a contrast in our weather - you view looks so dark and we're into long days now. It's good to be in touch with other peoples' environments. That's another thing I love about this WOYWW caper. And a very good morning to you Julia, although I can hear the rain here. 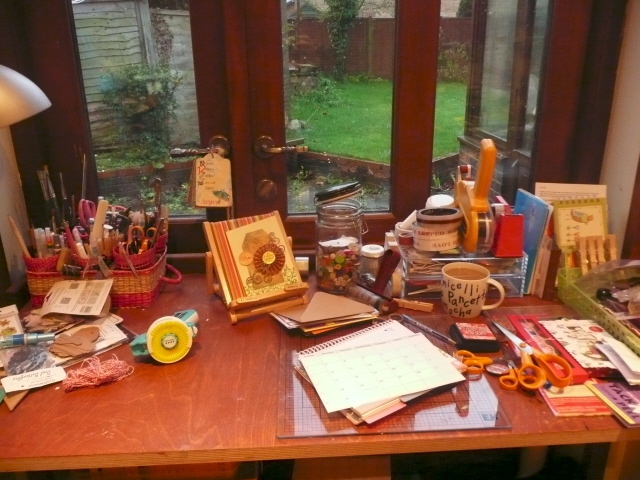 Nice tidy desk, it always makes me feel quite saintly when I do mine - not that often. Glad you did the link this morning - can go back to bed for my cuppa now and get ready for a big blog hop later. Awesome neat and organized post and desk and twenty pats on the back for getting your cards done. You are in imposter. What have you done with Julia? Ditto everything Ros said, I thought you'd forgotten to post this very popular bizzo (perish the thought). Anyway your desk looks awesom Julia and mine for a change looks a bit cluttered - not like me at all lol. Have a great crafty rest of the week. OMGoodness! I thought I was being good just thinking about sorting the C card list out but you have beaten me on that! OK, OK, you do win the Smuggy Mcsmuggersons weekly award...maybe even the monthly award...all your cards written...whew...you lucky girl. I still need to make about 25 more...and I am the slowest card maker in the world! Hey, your desk looks great and so does the garden...First time I have seen it...the light falls just right this time for peeking outside too! Well I have 50 made but have ground to a halt... wonder if that's all I need to do.. (ha!) Love your tidy desk today, how cool... shame my body clock didn't know you were changing the time as it still woke me (twice!) in the night.. Have a great day. Helen, 9 I think. Goodness me Julia, you are ready. I don't even want to think about Christmas until after Dec 1st, that's my daughters 21st birthday party. Then I can think Christmas and panic!! Written your cards already? Oh good grief, haven't thought about the C word yet!! I am still dealing with the boxes.... but I am at least able to post for the first time in months so that is the upside in my little world!! My Christmas cards are still in the planning stage right now, but you've given me incentive to get them thought out, made, addressed and sent out...thank you! Well well well, is this really the Julia that i've come to know and love... she was nowhere near getting her cards done - never mind written and finished. Did you contract them out or something???!!! I LOVE how you laid out your post today... very informative and efficient - seems you don't afford that same efficiency to your stamps. Santa's watching you know! Best get them done or he won't be coming down your erm, well, he just might not anyway. I'll tell him you've been busy though. Week 181 eh? Can't remember what week I joined you - but it was back in January 2010 - I think it was only a handful back then wasn't it? Obviously missed a few - but that's the beauty. You don't mind us popping in and out - but of course there are the ones that you look out for each week and wonder what's wrong if they don't appear. That's what this thing is all about - we look out for each other, as well as out desks! Big love to you Mrs D - you really have Dunnit lol (the cards I mean)!!! Paula x x x x (within the top 50)! yey! Morning (zZzzzZZZzzz) Your desk is looking very bright today...I miss mine!, and here, where I am, is dark and rainy!Nice to see the garden through the window, glad to see the spade's probably been put somewhere warm (must go and put mine away when I get home) Have a great week! Have a good week Julia. You really had me worried there as I went to the loo at 2.30 and no post from you... thought you were really poorly 'ick!!! Glad you're NOT! Your esk loks the most organised and the clearest I've sen in a while... well done to you getting stuck in yet managing tidiness too! Finished? Finished? Oh, alright... grudging congratulations! Glad to hear there's lots of mess out of sight, or I'd start to think I was in the wrong place. Happy WOYWW! Happy woyww, I can not believe you ave finished writing your cards, I have not even thought about who I am sending a card let alone write them. Yay, UK time! Thanks for that Julia. So nice to be on UK WOYWW time again. Julia, hi missing in action the last couple of weeks, don't you hate it when real life gets in the way. Gutted you've written your cards and so green, I haven't even made mine yet! Gulp. Great that you have written your cards, I haven't finished making mine yet. Really need to get organised I think. Bears are never up early enough to make the number one spot. In fact we've amazed ourselves by getting in the top 100 for a few weeks running now! Brilliantly written with all the headers. A tidy desk Julia, are you not feeling well?? LOL love the take on your post this week, such fun. Wish I'd got up early this morning instead of the 3.45am I got up yesterday so I could have posted sooner, will do next week. Your desk looks neat today! Very neat and tidy, Julia. Are you feeling all right? Lol! Nice post too, with the clear instructions about WOYWW and what it means. I've only just woken up (12 noon) so I'm way down the list this week - I'm sleeping really badly atm and my internal clock is completely out, so I'm keeping a different time schedule from the rest of the world. Will be going down for some breakfast after my early morning tea ha ha! Thanks for organising us again. Have a great WOYWW and enjoy the rest of your week. Only 3 pairs of scissors? How many rulers do you have..? Shoshi is beating me, she has 7 compared to my 5! Thanks for facilitating my nosiness!! Good morning Julie, hardly awake. Will read your post on trip south to Mission TX for Thanksgiving. Oh how I could use from fresh hot coffee. You'll have lots of fun messing up that clean desk. And cards done..wow now lots of time to do all the other Christmas things. Somehow Little by Little it all falls into place huh? Yeah, sunshine and storage..I need lots of both. Enjoy WOYWW I'm #87 this time. Your desk looks so tidy today! Mine looks like a glitter bomb went off, lol. Have a great week! I love your new formatting - and your desk looks lovely! Your great window view always gives a little hit to my heart. :<) But you say you have just FINISHED your Christmas card!? That is wonderful! I have only ONE card finished! I have noticed the joy people feel at being first to link - what fun! The word clarification continues to drive me crazy - with my poor eyesight I have to try numerous times and although I persevere I am so tempted to give up and not leave a comment. Wishing you a most wonderful Thanksgiving my friend - I hope the day is filled with all good things - including food - for you and your family! Well done you for writing your cards, I am very jealous, I haven't bought any or made any yet boo hoo. Desk looks great, glad you have better light. My mum said there was o light yesterday where she was in the midlands. But your card in your Ipad chair looks very friendly!! Have a great weekend. #100 today, that's much better than last week I think! Your fresh coffee looks yummy, and I think your completely allowed to be smug in this situation. Smug away! Have a great week and thanks for stopping by my desk! Do glory in your smugness, you deserve to! Warm and cozy pic of your desk.. It's good to change up the strategy and surprize us with a new posting time. It's 6 am on the west coast of Canada. Have a lovely week! Congratulations and "high five" on having your Christmas cards *written*! Amazing. Thanks for the inspiration a couple of weeks ago -- you basically said, Hey you make cards all the time, why not make some Christmas ones? I have made two cards so far with the ingredients for others standing by. Happy Wednesday. You desk looks very nice. Seems that you finish all you work and now you are ready for something new. I was amused to read there is a race to be the first to post. I have never really thought about it. I have no time to write on Wednesdays so I always do my post Tuesday night and schedule it to publish at 1.00 a.m. but I don't link it up until I get up in the morning. Your desk is just tidy enough without being empty. I have finished making my Christmas cards, swo writing them is the next big task. It is only a week or two before I post the UK ones. I have ordered the glitter glue carousel. It you're right; it was 'quiteabitofmoney', but I really think it will be money well spent. Waiting for delivery now. Lovely desk today, tidy but not too tidy. Cleanliness, organization, holiday cards done, and I'll bet your guts don't sound like a washing machine gong awry. The gods are not smiling on Princess Judy Land today. In fact, I think they are smirking and saying "TAKE THAT!" Ah well... looking good, your desk is. I am hoping to pay a few people a visit this week. Guess I should my own WOYWW post up first. Well done on getting your Christmas cards written - a very good reason to feel smug. wow, your desk looks so tidy this week, I am very impressed and Christmas cards written too! Finished, seriously? I am impressed!! Well, this is the first time I have posted my space here but I have been watching & enjoying for awhile now. This is such a great idea! Glad to see a few other messy people out there..not just me! My word....what a tidy desk! And Christmas cards ready to go? That's on my list of things to do, and wrting a letter to go inside of each...Oh goodness, the days will fly by now! I guess I should put my shadow box away and get busy on the time sensitive holiday needs. Again....your desk looks wonderful. Wow Julia - you really are way ahead of yourself - I haven't even taken out my box of Christmas stamps yet, let alone make a card!! - yes I know, I'll be sitting up late on Christmas eve making cards!! Oh, I do love your post today, especially the layout of it! I must say you are on top of things -- not only having your Christmas cards done but also written! Holy moly girl!! I'm not joining in this week but I'm a WOYWW addict and needed a fix! Happy Wednesday! I almost forgot what day it was, but managed to sneak in under the wire and be the caboose. I salute you and your ever-ready-with-crimble-card-ness! Awww... It's Clean! Hope all is well and Happy Thanksgiving! Hello Julia we had fab night tummy hurt from laughing so much! as to the book tree copy away it wasnt my idea in the first place i finished mine yesterday looks so good :) and so simple to do the bit that took the longest was me faffing with the decorations! Why, Miss Dunnit, I have NEVER seen your desk so clean and organized...and empty! It's INCREDIBLE that you've finished writing out all your Christmas cards, and it isn't even December yet! Kudos to you!!!! I, on the other hand, have not made a single card yet! None, nope, nada! I guess I should get right on that huh?